Celeste Edenloff, a blogger from Alexandria, MN, is a newspaper reporter for the Echo Press and is also a certified group fitness instructor through the National Exercise Trainers Association (NETA). Celeste has been writing her blog, “Confessions of a [former] Fat Girl” since 2009. Through the help of Weight Watchers, which she joined in November of 2008, Celeste lost 60 pounds. She reached her WW goal in September of 2009 and her personal goal in early 2010. Since that time, she has tried to maintain her loss – most of time, she has been successful. But she is human and slips up every now and then. Celeste does not diet, but is on what she calls a healthy living journey! She is a running enthusiast who received her running coach certification through Road Runners Club of America. In addition, although she isn’t taking any clients currently, Celeste is also a NETA certified personal trainer. Celeste is also an ambassador for Nuun Hydration and Sweat Pink. Celeste freely admits she doesn’t hold a degree in nutrition or exercise science, but loves food and fitness all the same. She shares through her blog her journey of losing weight, maintaining her weight loss, running, family life and more in an honest, tell-it-like-it-is style. She talks about the struggles, the challenges and the rewards, the satisfaction, if you will, of what it takes to start and maintain a healthy living lifestyle. Celeste cringes at the word “diet” – really, she despises it. She believes it’s only a temporary solution doomed to fail once the diet ends. Celeste believes instead in a permanent approach to food and fitness that naturally guides people into making healthier choices for the rest of their lives. She believes in and tries to live by the 80/20 rule. In other words, 80 percent of the time she eats well and exercises. The other 20 percent of the time is saved for splurges! She thoroughly enjoys eating cake and ice cream and drinking beer and wine – and does so without the guilt! Celeste enjoys running, walking, biking, shopping, playing on the computer, Facebooking, Instagramming and spending time with family and friends. Most Saturday nights, you can find her and her husband, Al, at home for their “date night” trying new healthy recipes and learning about and enjoying red wines and dark beers. The first photo was taken on October 8, 2008, when Celeste and Al got married in a hot air balloon overlooking the vineyards of Napa Valley, California. The second picture was taken on October 8, 2013, on their five-year anniversary. 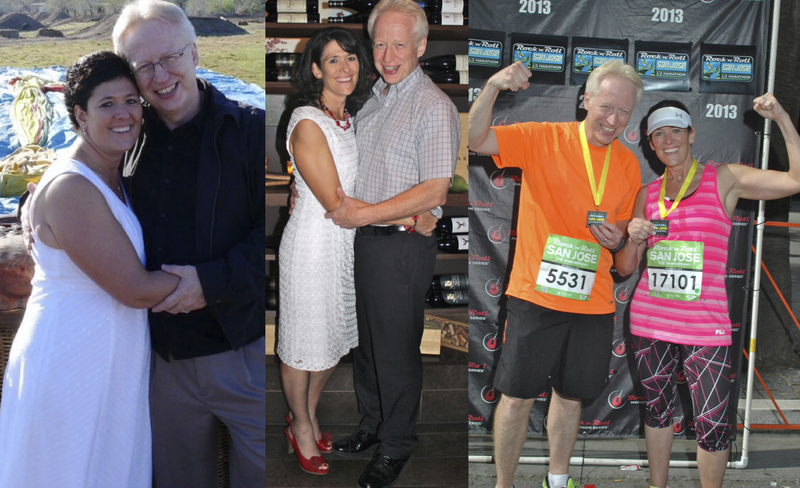 They went back to wine country to celebrate not only their anniversary, but also their healthy journey success. Between the two of them, they lost about 100 pounds. The third picture was also taken on their five-year anniversary trip, in San Jose, California, where they ran in the Rock-n-Roll San Jose Half-Marathon. This was their second half-marathon. Celeste and Al started running seriously in 2010 and to date, have run more than 160 races, ranging from a one-mile sprint to a half-marathon, including everything in between – 5K’s, 10K’s, 10-miles and more. Running has become a new way of life for them and they couldn’t be happier.